I love the internet. I just love it. For things like this, i.e. actually communicating with artists on a one-to-one level, it's just the best thing ever. There are a lot of other inventions that are quite useful, like toilets, airplanes, and various medical advancements, but the internet is just parfait. 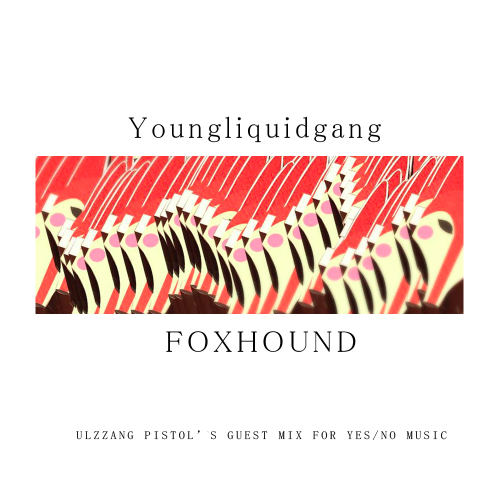 So I was chatting to Zeon Gomez aka Manila-based artist Ulzzang Pistol on FB & I asked if he wanted to make a mix and he said yes, so here we are. But this is a mix with a difference: besides being the 14th Y/N Guest Mix, it's also a showcase of a collective part-founded by Zeon himself. "I make my own music by mixing J-pop influences with house, disco and dream pop, usually through the use of Japanese lyrics," in an email he tells me about what he does. "I don't know if you can label it as J-pop, but I'd like to call it that way I guess. I am also a Co-founder of the Manila-centric collective called YOUNGLIQUIDGANG, where I handle PR and Artist Management duties." Youngliquidgang itself is a hotbed of creativity – a 12-strong (and still growing) group of young and talented Filipino music artists, mostly all electronic; "Basically," says Zeon, "YLG is inspired by a family/brotherhood kind of feel, where like-minded artists support each other into creating material and refining their talents." The collective was co-founded along with No Rome (aka Rome Gomez, his brother) and Keats Collective affiliate, MERLINDA/WALLS (Ethan Namoch, also making music as COEXIST). Zeon describes the simple story behind its conception: "We only wanted to make a community of electronic musicians around our university [De Lasalle-College of Saint Benilde], but it ended up being a nationwide collective after we decided to move out of the school's music scene." From the downtempo soul of singer/musicmaker Hana ACBD and the cosmic blizzards of Local Disk (C:), to No Rome's lush glitterscapes and vapor-leaning R&B tracks from Colombo Beats, YLG is a varied bunch – but there's a bond between all of them that's less loose collective, more tight-knit gang (hence the name, I guess). "What connects us all together, apart from similar tastes in music," Zeon elaborates, "is this CULTURE we shaped inside our group, this family-like atmosphere, where we don't just meet on a artistic level but on a personal one as well, we sort of look out for each other." You can see this in the various remixes they do for each other's tracks, or in the way that vocals are offered up from one to another, etc. "In short," he continues, "it's about love and respect, where we believe in the skill of others (especially the under-appreciated artists/talents)." Which is a lovely message that I imagine (or hope?) many others in the music community share and equally uphold; I mean, it was/is the YES/NO's raison d'être in the first place. As for the mix itself, it's choc-a-bloc (bet you never thought you'd hear that ever again) with goodness from the fair isles of the Philippines, beginning with the moody 'ALWAYS' by MSN メッセンジャー (that's 'Messanger' in katakana btw) with its booming kicks, pitch-shifted vocals and classical ambience, continuing on a smooth journey of differing slices of electronic chill, and ending on a high with colourful dose of electro-pop The Valiant Vermin (self-described as: "Bedroom Project of some high school chick") with cute 'n' catchy rapid-fire vocals. Zeon sums it up: "This mix goes to show that, though our artists are from different genres of electronic music, we share a form of cohesiveness or oneness with the vibe our tracks emit, to give a tag it'd be 'UNITY IN DIVERSITY', much like a family."